In the French countryside of Normandy, Pierre has been making cookies since the 19th century. Pierre Biscuiterie continues this legacy of simplicity, naturalness and pleasure. Its selection of all natural and GMO free cookies is among the most refined daily treats. Wrapped in stay-fresh packs, they are exceptionally good and crispy and be enjoyed throughout the day. 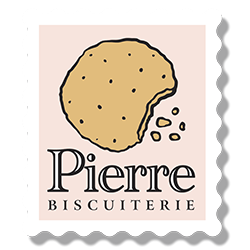 The high quality ingredients and the Frenchy lovely packaging have made Pierre Biscuiterie the most fashion crispy butter cookies from France !